After several days drought of absolutely nothing to write, I finally have a great topic. Today is Vincent van Gogh’s 159th birthday! They had an article with slide show on the artist today on the Huffington Post. Van Gogh happens to be one of my favorite artists, and I have had the great fortune to see a lot of his works in person either on exhibition or at the Van Gogh Museum in Amsterdam or other permanent collections. For a complete list of all of van Gogh’s painting (I had no idea there were so many), check out this link. These are just the oil paintings, though he was also did a enormous number of sketches, drawings, watercolors and other graphical works, which can be accessed from the same website. My undergraduate degree is in Art History, so I love going to museums and checking out cool exhibitions and have seen some really cool art this way. I saw a particularly amazing exhibit on Van Gogh and Gauguin and their influences on each other, which was fascinating, at the Van Gogh Museum. Apparently Gauguin did some paintings of sunflowers, after receiving paintings of sunflowers as decoration for the house in Arles (where they were both living together). For more information on the Gauguin/Van Gogh collaboration and relationship, please see this website. I would like to finish this post by including images of my favorite van Gogh works. Does anyone else like van Gogh? If so, what are your favorite pieces? 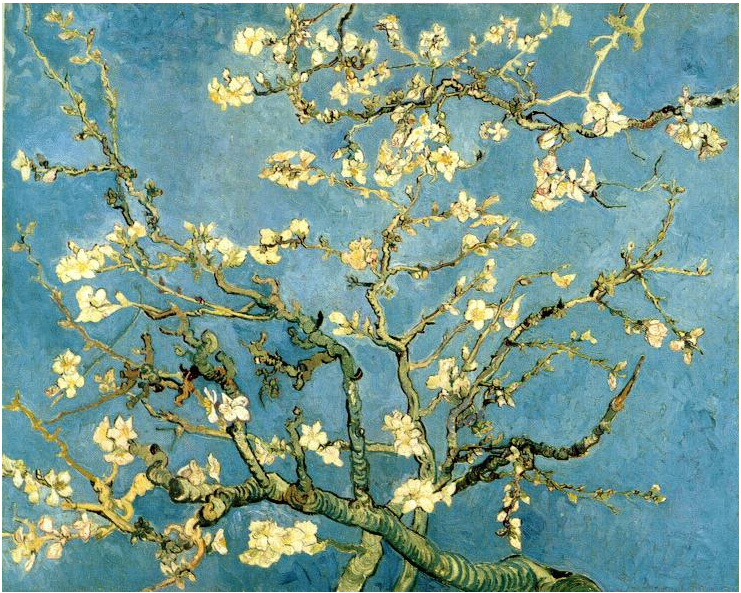 This painting is entitled Blossoming Almond Tree, Saint-Remy, c. 1890. Van Gogh created this work for his baby nephew and godson, also named Vincent. He was influenced by Japanese block prints, and the painting represents rebirth. This painting is entitled Wheatfield with Crows, Auvers-Sur-Oise July1890. I have always liked this painting even though it is a dark, sad and foreboding painting, as exemplified by the dark colors used and all the crows depicted. It was done a couple of weeks before his death. For a more in-depth discussion of this painting, head over to this website. So today I have been grasping at straws, trying to think up something interesting to write on the blog. Usually I find something good to refer to on FB but not such luck today. Good news first: We got our taxes done finally! We were waiting for the last self-employment form from my husband’s previous job in South Carolina. Oh yeah, for those who didn’t know my hubby and I moved to Arizona cross-country from South Carolina when I was 7 1/2 months pregnant with Liam, all 3000+ miles of fun. Actually it was an interesting trip, as I have never driven through northern Texas, Arkansas, Oklahoma or New Mexico. I’ll skip going back to the first three but wouldn’t mind exploring New Mexico a bit more. The other good news is that after getting frustrated with our current lack of money situation two days ago, my husband decided to go through about 8 boxes of random crap in the house, so we got rid of that many boxes yesterday. The shelves for the remaining bookshelf were finally put up today (the other two bookcases were surrendered to the pit of despair thanks to the movers), and I was able to put away a fair number of books. I still have about 3 or 4 boxes of books to sort through and put up, but this is definitely a good start. Yesterday we went through another four boxes of books, and still haven’t managed to completely fill one bookcase (which shows you how much I have gotten rid of), plus he finally cleared the boxes from the computer room and off the couch, as we plan on donating that piece of furniture. While browsing Gail Carriger’s blog this afternoon, I found these links among her daily posts that I thought I’d share. I’ve never published anything myself, but I do occasionally write some poetry when I feel inspired. However, I thought this post on creating a title was especially useful as sometimes I end up changing my title what seems like a dozen times before I’m happy with it. She also had this link called Inside the Mind of an Octopus, which is really interesting, and written by one of my favorite children’s nonfiction writers (Sy Montgomery). I’m not sure why, but I’ve always been fascinated with cephalopods, i.e. squids and octopi. The third thing I found while browsing blogs (This time it was a hilarious new blog I just started reading called The Blurred Line) as this article about how eating a small amount of chocolate can actually help your metabolism. I know this doesn’t mean that I can totally pig out on some Cadbury bars, but it is an interesting concept all the same. I especially liked the quote from Katherine Hepburn at the end of the piece. I had an interview yesterday with my local public library for a part-time Library Assistant position at one of five branches. I think it would be a cool position because it involves doing a little bit of everything, such as circulation, teaching basic computer classes, general reference, as well as helping out with children and teen programs. I believe the interview went well and I’m hoping for a positive response within the next two weeks. I receive a weekly newsletter called @ Your Library: A Campaign for America’s Libraries from the ALA, and it had a couple of good articles that I wanted to share. 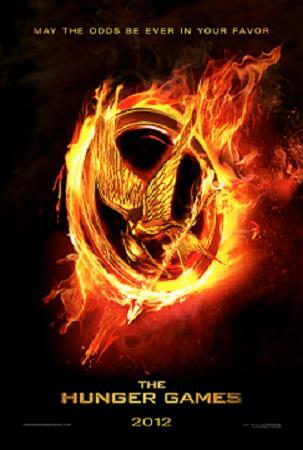 Since the Hunger Games came out today (yay!) and I loved the series, I thought I would share this article about what libraries around the country are doing for teens in response to the movie and promoting the books, and even a library in Pima County, Arizona is getting in on the action. I did something similar to this for a teen program I had to plan for my Young Adult Materials class in Graduate School. 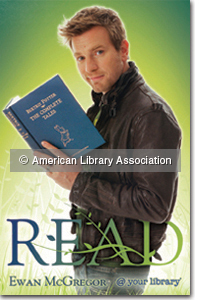 The ALSC has released their list of the 2012 Notable Children’s Recordings, aka audiobooks. As the website says, these audiobooks are “for children 14 years of age and younger of especially commendable quality that demonstrate respect for young people’s intelligence and imagination; exhibit venturesome creativity; and reflect and encourage the interests of children and young adolescents in exemplary ways.” Now I know a lot of people don’t like audiobooks because they think they are boring, but sometime if you have a reluctant reader, they will use audiobooks instead of actual books. It eases them into reading. I personally like them because a lot of times I won’t read a book or just couldn’t get into one, but by listening to it on audiobook, I had a much easier time with it (latest example being Madame Bovary by Gustave Flaubert). Now I hadn’t heard of most of the one on the Notable list, but I was excited to hear about Jack Gantos’s Newberry award-winning book Dead End in Norvelt was being read by the author (who I think does a fantastic job on his audio versions) and that The Incorriglible Children of Ashton Place, Book 2: The Hidden Gallery was being performed by my favorite voice actress Katherine Kellgren (of Bloody Jack fame – she does an absolutely brilliant job on that series – for me she is Jacky Faber). I have not read the first book, but would like to, so I could listen to this book. On a totally random side note, I was browsing through the Teen section on the website for @ Your Library and they mentioned the READ poster that Daniel Radcliffe had recently done, which I had seen before. Whilst looking for that image at the ALA online store, I came across this one (see below) of Ewan McGregor and thought “You know, if Ewan told me to read, I definitely would; though let’s be honest, I would do pretty much anything he asked me to do.” Yay for Scottish guys! So normally my days are pretty boring, but today while I was going through my Goodreads mail (which I do about every month and a half), I found a lot of cool author blog posts and decided to share some of them. I found a really cool article that Philip Pullman (author of the His Dark Materials trilogy and other great books) had written about public libraries. Since I’m such a big fan of public libraries and use mine weekly, I wanted to share this. Next is a blog post from an adult steampunk writer, Gail Carriger, whose Parasol Protectorate series include some of my favorite books. I highly recommend the series to any who have not read it. Her new book Timeless has just recently been released and though it is the end to a wonderful series, I am so excited to read it!! Ms. Carriger does some really interesting posts and recently did this one on recreating a Victorian dinner and includes the recipes that she used and photos. The third post is from Tony DiTerlizzi, a children and young adult writer who I have loved ever since I read/listened to The Spiderwick Chronicles. His most recent series, which starts with The Search for Wondla is a highly original and amazing book as well. The next book in the series A Hero for Wondla looks to be awesome (as far as story and illustration goes) as well and I am looking forward to reading it. The post is on his new guide for teachers and librarians for The Search for Wondla and Kenny & The Dragon, which includes discussion questions and activities they can use for teaching/programming. The fourth thing I wanted to mention today is that it is World Poetry Day, which I just found out this morning. For more information, check out this UNESCO website. In honor of this, I would like to share my favorite poem of all time, Pablo Neruda’s One Hundred Love Sonnets: XVII, taken from this website and the book The Essential Neruda: Selected Poems. It also happens to be one of the most romantic and heartfelt poems ever, in my opinion.